Having starred in a trio of very good films in the shape of ‘Source Code’, ‘End of Watch’ and ‘Prisoners’, Jake Gyllenhaal has made a name for himself as an actor that wants to challenge himself and pick projects that may not be guaranteed to be lucrative money makers, but offer him diverse and interesting roles to throw himself in to. This is also making him a better actor, and his performance in this film could be said to be a result of the work he’s done in his career to further himself as an actor, because it’s arguably a career best. He’s always been great at portraying oddballs ever since the ‘Donnie Darko’ days, and he brings all that to the table here for the chilling, entrepreneurial Lou Bloom, who digs out a career being first to gruesome crime scenes and selling footage off to whichever news channel is the most interested. Director Dan Gilroy demands a lot from his leading man, who often carries scenes with just a look or a particular mannerism and succeeds every time, where it could have been so easy for a performance requiring such nuance to fail. It’s the faith that Gilroy places in Gyllenhaal that allows him to pull off the performance, and it wouldn’t be surprising to see his name in and around the major awards come the time. This is not to say that Gyllenhaal is doing all the work here, because Gilroy ensures that he has a brilliant script to work with, the like of which Gilroy hasn’t managed before, with disappointing fare like ‘The Bourne Legacy’ and the disastrous ‘Freejack’ to his name. His work here though is elevated to another level, and both the astute direction and gripping script contribute to a film that revels in atmosphere, grabbing hold and not letting go for its duration as we follow a central character who will stop at nothing to succeed in his new-found field. As well as its well-engineered moments of tension, it also has a welcome darkly comic edge, often in situations where Gyllenhaal’s Bloom says or does something inappropriate whilst in conversation with another, his polite manner making way for what often are his true feelings. 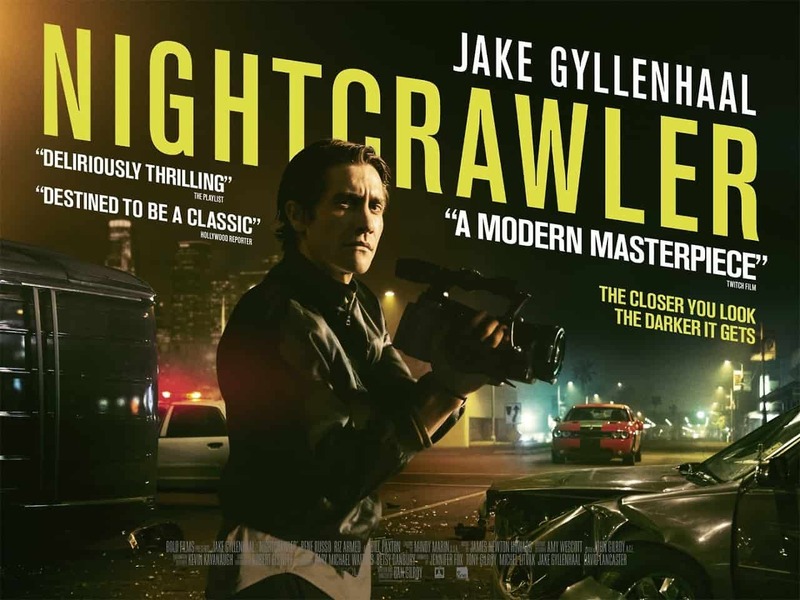 Ultimately ‘Nightcrawler’ is a film that bends the crime thriller genre, throwing in to doubt the morality of crime journalism of the sort that Bloom takes advantage of as well as providing us with slick drama and an interesting examination of what people are prepared to do to succeed. It’s been a while since ‘Network’, Sidney Lumet’s 1976 masterpiece trod similar thematic lines and it’s nice to see those themes updated, given a noirish sensibility and turned in to something that takes those themes and gives them a bit of the ‘Taxi Driver’ treatment, the comparison between Lou Bloom and Travis Bickle being there for all to see. Hopefully the success of this films means Gilroy will have the confidence to go on to make equally rewarding films in future, because ‘Nightcrawler’ is a film that subverts those common thriller themes very well, and Lou Bloom is a character that will linger long in the memory.